2016 Fall Fest - concerts promoting tourism and benefiting live music, education, and health-related nonprofits on the Central Coast. PLEASE SEE 2016FALLFEST.COM FOR DETAILS. THE NEXT 2016 FALL FEST SHOW IS Luis Munoz w/Teka at Monarch Club Ballroom November 11. 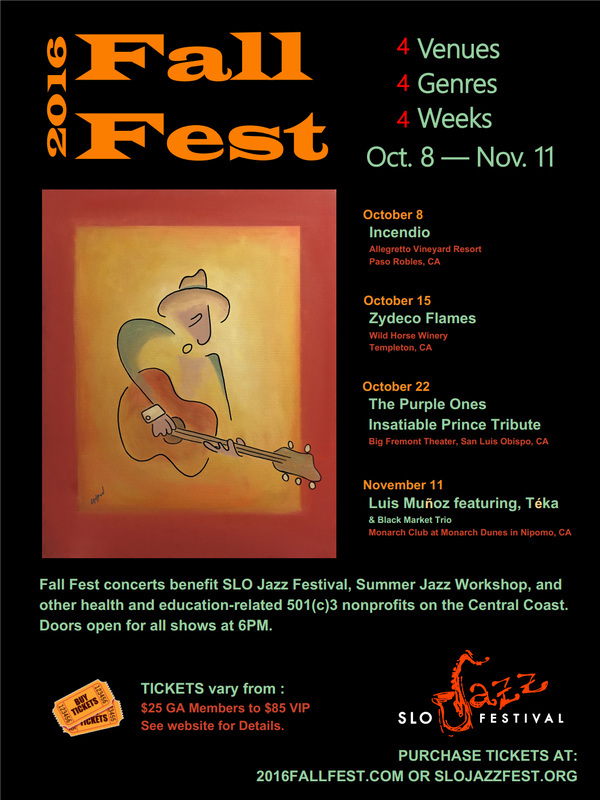 The 2016 FALL FEST is a benefit to raise money for SLO Jazz Festival 2017 and the Summer Jazz Workshop and Central Coast nonprofits. All concerts are 6PM - 10PM unless otherwise noted. Oct. 8: Incendio live at Allegretto Vineyard & Resort in Paso Robles. Nov. 11: Luis Muñoz, featuring Téka, live at Monarch Club at Monarch Dunes in Nipomo, CA. Click here to hear bands and learn more about the line up. There will be a live auction and silent auction and raffle at each concert with exciting items, trips, and bands you can bid upon. List coming soon. Click here for 2016 sponsors of FALL FEST listing. Concert and Fall Fest event series tickets are on sale now!